Rearranging syllables and translating words in his mind came naturally for 16-year-old Dorian Baldes from a young age. He began writing poems and stories in first grade. When Dorian’s family moved to Pine Ridge, South Dakota, he started on a journey to fulfill one of his life goals: to learn the languages of his ancestry — Lakota, Hispanic, French, Navajo, and Shoshone. Dorian Baldes (center) shares his thoughts during a Dances With Words Open Mic Night. At the Red Cloud Indian School, Dorian enrolled in the Lakota language class and persevered through embarrassment at his mistakes and lacking someone to speak the language with. He speaks it in daydreams, in translating English lyrics in a song, and to his brother. He is revitalizing the Lakota language on his tongue and for his people. As a finalist for the Rising Star of the West scholarship on Black Hills FOX News TV, Dorian related thoughts on social issues, opinions, and solutions back to Lakota values still applicable to today. But the thought of writing poetry in the Lakota language didn’t occur to Dorian until friends prodded him into joining Dances with Words™ (DWW) in 2017. 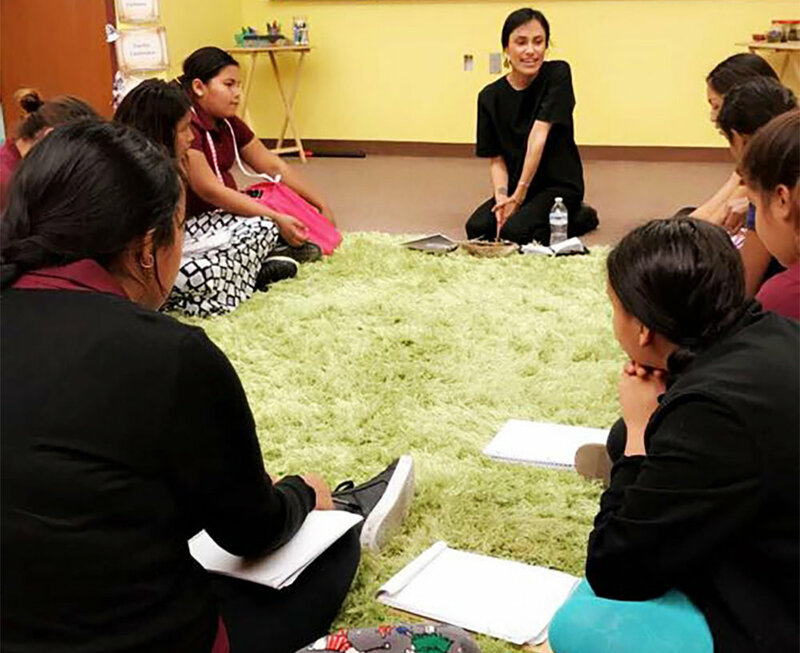 A First Peoples Fund youth development initiative, DWW works with young people, adult mentors, high schools and nonprofit partners on the Pine Ridge Indian Reservation to empower students and community leaders through literary, spoken word and other art forms. Youth poets shouted out words to create a "word map" of the what comes to mind when they think of the Dances With Words program. Dorian decided to compete for a place on the Dances with Words™ team for the annual Brave New Voices International Youth Poetry Slam Festival to represent his people and culture. He made the 2018 team with his poem composed entirely in Lakotiyapi. Springtime and the awakening of plants and life, the washing away of snow and pain as rain falls, the rejuvenation of the earth after the hardships of winter — Dorian wanted to convey those emotions in an unconventional way. He allows the flow of the Lakota language to bring depth and meaning to his poetry. Though Dorian is not yet fluent in the language, he continues to learn and to use it every day. Dances with Words™, with its pilot program in the Pine Ridge Reservation and Rapid City, South Dakota areas, helped lay the foundation for Dorian to move into spoken word poetry, bringing together written poetry and his passion for the Lakota language. Dusty Nelson (Oglala Lakota) witnessed the power of this program with her students at the Anpo Wicahpi Girls School in Porcupine, South Dakota. Former Language Arts Educator at the school — which centers on Lakota culture — Dusty is an adult learner of the language. When Dusty brought her students to a DWW open mic, it was an eye-opening experience. She realized the natural connection between the language and poetry as the DWW spoken word poets performed. Dusty talked to Laree Pourier (Oglala Lakota), First Peoples Fund Program Manager for Youth Development, about bringing the program to Porcupine and working with the Anpo Wicahpi Girls School students through the DWW curriculum. Dusty watched as girls who had trouble expressing themselves creatively and emotionally opened up with Laree. Laree Pourier (Oglala Lakota) leads a workshop with the girls at Anpo Wicahpi. With Laree’s guidance, the DWW curriculum gave the girls opportunity for expression and opened their minds to their own potential. Dusty sees potential in creating an educational foundation of learning through cultural experiences, thereby teaching mainstream concepts through Lakota eyes. In preparing for the Brave New Voices international poetry slam competition in July, the DWW team recently attended a community poetry workshop hosted by Layli Long Soldier (Oglala Lakota) and her auntie, Tilda St. Pierre (Oglala Lakota). Layli’s full-length collection Whereas (2017) won the National Books Critics Circle award and was a finalist for the National Book Awards. She has been an essential collaborator in Dances With Words and is currently working with Laree to expand First Peoples Fund’s Youth Development work in some exciting ways that will be announced in 2019.